No. You'd want .35 caliber ammo for the .35 cal carnivore. Will this take down hogs and bucks? With the right load definitely . Can the bolt be switched over to left hand like Benjamin rifles? Will the .30 cal polly mags work in this rifle, or are they too long for the magazine?? The 30 cal Polymag in my gun would not fit without trimming point off with nail clippers. It did not affect accuracy. On either the 30 or 357 cal model you can adjust the hammer spring to increase power. Watch the Rick Eustler video on how to do it on the BT65. Same as carnivore. My 30 cal was at 802fps out of box. With a slight tweak I'm now at 920 fps (81 fpe) with 44.75 JSB. I get 14 consistent shots at this level. this gun is a beast! Let me answer these in order: If you are getting 730,132 fps I think you are doing pretty well. That would just about liquify a deer and you should come with a sponge to collect your trophy. A drop to 690fps from over 700,000fps would be expected, but I think the temperature change would freeze the oxygen out of the atmosphere. If you want to jump back up to over 9000 fps or Kelvin you may want to consult a physicist. I bet you can definitely take down 125lbs of something, but consult your doctor. And yes, some 150 pound are deer, but some are just people. Hope that helps. Email hatsanusa. and inquire . Why would a rubber seal come out when you go to change out clip and the rifle is got louder? What is the most accurate cast bullet for this gun? Lee has a 358-105grn-swc and a TL356-95-rf that look like they would work well if sized correctly. Aha! I had the same question, so I emailed Hatsan in Turkey, that's where they make 'em, so I figured that they would be the one's to ask. Anyway, per Hatsan: neither the .30 or the .35 barrel's are choked, so you CAN use slugs in either caliber, as long as they fit the mag, which is 13.25 mm. The .357 barrel's are .354.45" so, the recommendation is for . 356 pellets/slugs. The AV 95 gr. slugs SHOULD fit, but people have reported difficulties with feeding the 95's, the AV 105's - according to user reports, fit and feed. Also, users have reported the Hunters Supply .356 95 gr. slugs, fit the magazine, and feed. No one knows why exactly, but that is what's up, according to Hatsan, AV and Hunters Supply. Does anyone know where to find a 1/8" BSPP probe for this gun? I'd like to have an extra just in case. Might want to look up Allen Zasadny. He would be the man to go to for PCP tunes. Don't have his phone number, you'll want to check the yellow airgun forum to find it. It says there a special for a free scope and bipod a $115 value. what scope and what bipod do you get? The special is no longer there. Adding it to the cart would have shown the scope/bipod specs. Yes, first day. Have to make sure the bolt handle is pulled ALL the way back till you here that click. Then it will shoot. Is the air cylinder the same as (interchangeable with) the BT65? Yep, 'tis, and the Galatian also as well and in addition to. Once the moderator was removed I was able to lower the point of aim on the scope by several inches and it no longer shot from side to side. My Carnivore will not group at 50 yards I took the end cap off the barrel and saw that it was shaving lead and had a large gouge out of it from the pellets. When I removed the moderator parts it shot much better what should I do. Oooh, that's bad, I would return it, Pyramid has a great reputation for service after sale, and get the 20 for $20 or 10 for $10 tests Pyramid offers before you take the replacement, sorry to all concerned, but I hope it helps. Just my 2 cents here, but if you're buying a rifle in the 9mm/.357 caliber range, I would think the idea is for hunting small game and I'd be more interested in the FPE of the rifle over how many feet per second that pellet is traveling. This thing is rated for about 95 FPE, a standard .22 LR is give or take about 115-120 so that's a LOT of power for an air rifle and it's that muzzle energy or FPE that's making for a one shot clean kill. Like I said, just my 2 cents but something to consider. can you use round ball in either the .30 or .35? Although I haven't tried it myself, I hear from other Hatsan wielding airheads that they work in the .30. I heard that RB work in the .35 as well, but, again, it's what I've heard, I have not tried it myself ... Yet. I plan on it, but I haven't been able to get out much for a while, so if you do, and it works, please post your results here. Round ball works good to about 50 yds from my Hercules. I imagine the barrel twist is very similar or identical. Try them. They're cheap. Is the BT.25 Walnut stock interchangeable with the BT.357? Well they are about the same as the Evanix air guns and the power on these can be easily turned up. Really they are about on par with most other big bores (in .35 cal) except for custom guns and the Sam Yang Recluse. But like I said, they can be easily adjusted and they (at least mine) shoots 1" 6-shot groups at 50 yards without any problem at all. However, I am not in total disagreement. I think the 150 and 95 FPE would have been a good idea. . Yes well, Hatsan listened to rick eustler at airgun web as to how much power is deemed reasonable... Personally i agree with you joe, i think they should have aim at 150fpe in .35 and 95fpe in .30. that would be practical for real hunting. Just adjust the hammer tensioning screw at the back of the receiver and use the Hunters Supply 79 grain slugs. You won't get 150 (in .30), but I'm getting over 100, lots of shots and it's nowhere near broken in. No. It is possible to gain power from this gun, but 200 fpe is not feasible for this rifle. Abe, Yeah but how many shots are you getting? Im in the process of tuning the .30. Its hit as high as 960 fps stock, over 90fpe. Im confident by the time its done it will be in the magic number of 100 plus for the .30. Does the 23" barrel length include the silencer? No. The barrel is 23" long, and the silencer is about 6.5" longer then the barrel. Is there any non-lead ammo available for either .30 cal or the 9mm that will shoot well in this gun? We do not carry any and from the few tests with the gun I have seen, none have used non-lead ammo. What barrel do they use? Is it choked? What twist rate? .30 bwalton told me specifically the .30 and .357 are NOT choked. I suppose possibly they anticipate owners trying slugs is a high possibility. My bt65 is 17.7/1 twist, not sure on big bore. 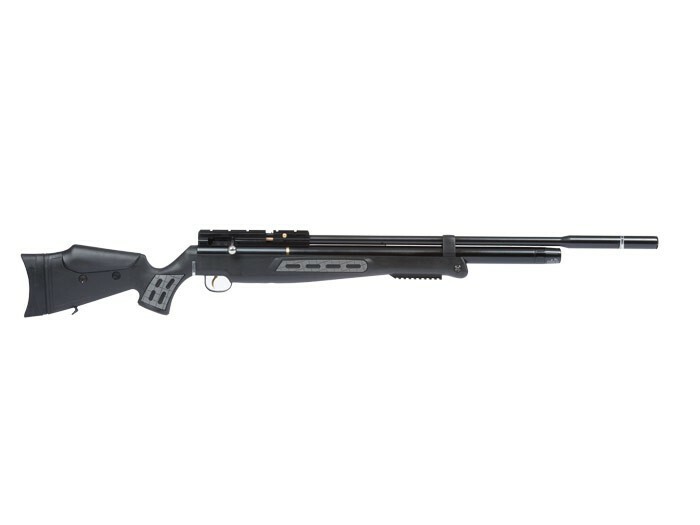 Hatsan makes their own barrels. You may want to reach out to them regarding the twist and choke. I suspect that at least the .30 is choked but we will not know until they come in. Didn't the benjamin rouge .357 have roughly 300 fpe? Why is this .357 only 95fpe? Is it possible to mod the amount of air per shot on a gun like this to match the rouge? The rouge shoots (about) 200ish fpe, the reason for that is its designed to hunt BIG game. the Hatsan's are designed to hunt small to medium game at long distances... hence the higher shot count and much greater accuracy. So to make a long story short, the two guns where made with differing purposes in mind; that is why. And no, you would have to make SEROUS modifications to get anywhere near the rouges power level. The Rouge only fired with 200 fpe. You would have to ask www.hatsanusa.com about that. The original (gen 1) Rogue had about 240 FPE, the later (gen II's) have over 200 FPE. (I have one). For a .357 that's a ton of power. I'm sure some of it was due to the electronic metering of the air and their design goals. It actually has more power than all of my .50 Air guns except the Dragon claw - It was an amazing gun and the Benjamin Bulldog (close to 200 FPE) probably shares some of it's technology. That being said, they are different animals. I think a choice was probably made for shot count. (My Rogue will do 4 (maybe) full power (heavy/high) shots on a fill, more on lower power). 95FPE is still close to a rimfire and impressive for an air gun and with the high shot count that'll be another advantage. Note that most of the other .357/9mm air rifles (Evanix, etc.) produce about the same more or less. The Rouge could make 350fpe. It also was twice the price, not as accurate and wasnt as quite. As in many cases when stating foot pounds Energy, the size, but not weight of Pellet or Bullet is listed. Can an effort be made to do this on all products? IS THERE A WAY TO LOWER SHOT COUNT AND INCREASE FPS? There are various ways to increase power; hammer spring preload, spring change, return spring decreased, valve modified, air passages bored, smoothed and ported, longer barrels. You can adjust the hammer spring preload. You would have to contact www.hatsanusa.com about that since they haven't been released as of yet.